And we're off! 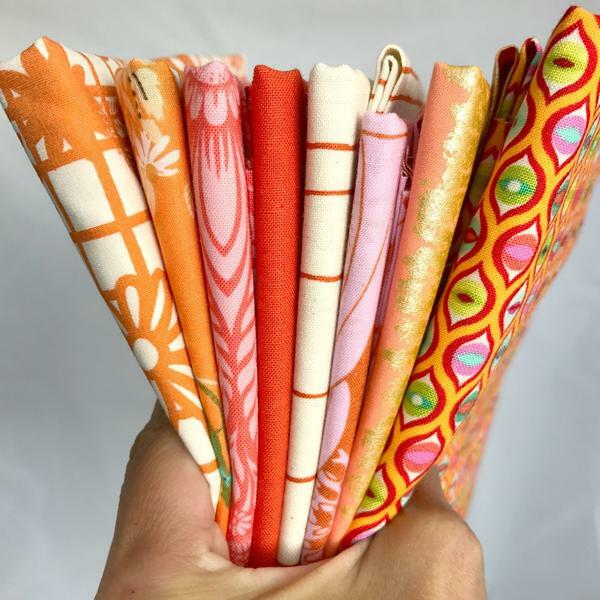 Around the world fabric lovers are diving into their stash and discovering new connections with 30 Days of Fabric Stacks. It's such fun to see ideas igniting, inspired by the same simple sparks, yet shining with unique personality. If you're wondering, it's not at all too late to join in. We have oodles of time left to complete the challenge and you can even make more than one stack per day. Just start with Day 1 and go for it! New folks are beginning the challenge every day! See this post for all the details. I've just posted my Day 5/Baby stack this morning. I like to keep it casual and resist over-thinking these things. My stack started with that Heather Ross piggies print, which has been languishing in my stash for years, literally. The fabric wanted limey greens, oranges, yellows, so I found helpful fabrics from my stash that could jive with a "baby boy" sort of look. At the last minute I added the gray grid print for a boost of cool neutral. One of the unique things about Heather Ross' piggies print is the pairing of warm shades with a very cool gray background. I feel like my stack supports that well. My favorite stack I've made so far is this grouping for Ethereal. I know you're probably thinking, "enough with the peach and mint, Rachel!" Seems I can't get enough of it right now! Ethereal was a tricky prompt for many who found they did not have anything in their stash that felt light and airy. Don't forget that you can always use one of your Skips to work through a tough theme (see rules for directions). I love what Nancy had to say about Ethereal and also enjoyed Daphne's block created with her Ethereal fabric stack. Today I get to award our first participation prize! A random draw of all those photos submitted with the event's hashtag....awards a $30 gift certificate for Bobbie Lou's Fabric Factory to Quilter397 for her Ethereal stack! Congratulations! I'll be in touch to deliver your prize. Oh, fabric, how we love thee! And color, my truest first love. J'adore.